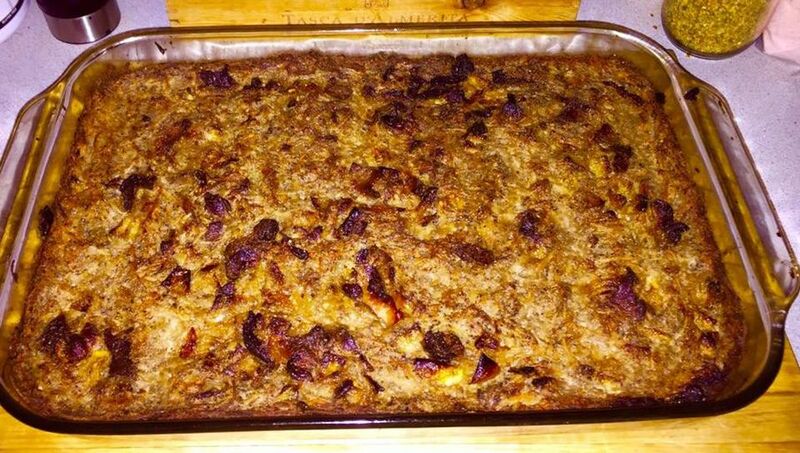 This traditional recipe for Lithuanian savory potato pudding, known as kugelis or bulviu plokstainis (literally "flat potato"), produces a dense, heavy casserole that is considered a national dish of Lithuania. Kugelis is commonly served with applesauce, lingonberry preserves, sour cream, or crumbled bacon bits. It can be eaten as a main course or side dish. Compare this recipe with an easy Lithuanian kugelis recipe made with frozen hash browns and the Polish potato pie recipe known as baba kartoflana or kartoflak. Place the oven shelf in the middle and heat the oven to 350 F.
Coat a 13-by-9-inch pan with cooking spray and set it aside. In a large skillet, sauté bacon and onion until lightly browned and caramelized. Leave them in the skillet and do not drain the fat. Set the pan aside to cool. In a large bowl, combine eggs, milk, evaporated milk, salt, and farina. Add the bacon-onion mixture and drippings. Stir until well combined. Using a food processor or by hand, finely grate potatoes, squeezing out excess moisture. Work quickly so the potatoes don't darken. While they are still fine to eat if they darken, it is less appealing. Add the grated and squeezed potatoes to the bacon-egg mixture, combining well. Pour the potato mixture into the prepared pan and bake for 1 1/2 hours or until the top is quite brown and the interior is solid but still moist. Remove the pan from the oven and let it sit for 5 minutes before cutting into squares. Serve as a side dish or as a main course with a salad. Cover and refrigerate any leftovers. You can enjoy leftover kugelis by heating portions in the microwave or browning them in butter. Farina is milled wheat that is used to make hot cereal. It is available in the cereal section of the market and one common brand is Cream of Wheat. If you don't have any you can substitute 1/2 cup of plain breadcrumbs. Because this recipe uses farina, it is not gluten-free. However, you can instead use gluten-free cream of rice cereal as a substitute. Lithuanian Zeppelin Potato Dumplings Recipe: Known as cepelinai, these football-shaped dumplings made with a raw and cooked potato dough are filled with meat or cheese. Lithuanian Potato Sausage Recipe: Vederai or potato sausage can be made entirely meatless or with the addition of bacon. The only other ingredients are grated potatoes, eggs, onion, seasonings, and a few tablespoons of flour.